I'm a big advocate for training, as you might expect of someone who earns a substantial portion of his income providing training services. But my enthusiasm is mitigated by the realization that training usually fails to yield noticeable or lasting changes or improvement in those who are trained. This is particularly true of so-called "soft skills" training like that related to leadership, business development, project management, client service, or communication. Don't you typically expect behavior change and performance improvement when you invest in training? Then you need to look beyond merely training. That's not to suggest that training isn't valuable in meeting such goals; it's just not the whole solution. Unfortunately many managers seem to think it is, or at least tend to rely too heavily on training to address performance deficiencies. First, define what specific outcomes you're seeking. While training has other inherent benefits, let's focus on the one that most managers expect in return for spending thousands of dollars on it--performance improvement. That, of course, involves behavior change. Training works best when it is part of a larger performance improvement initiative where the expected outcome is changing how people do their work. Training, then, becomes only one step towards achieving the desired results, and is dependent on the success of the other steps. So before you hire a trainer or develop your own in-house program, determine specifically what you want it to accomplish. Align training content with the specific changes you intend to make. I've long been baffled by firms that invest in training that teaches strategies or methods they have no real intent to adopt. Do you want to improve how your people manage projects? There are some very good project management training programs available. But you must first address the question of how your firm is going to manage projects differently in the future. There's no point having someone teach your people to do things a certain way if the firm will continue to do it another way. Firms routinely bring in trainers or send employees to outside training programs to learn a "better way." But those employees won't be changing how they do things unless the company is committed to such changes. So select training based on what changes your firm or department intends to make (or that simply reinforces what you are already doing). Build the necessary "infrastructure" before training. The way you do your work is usually supported by certain procedures and tools, both formal and informal. If you expect changes in how your people work, you'll need to make corresponding changes in the "infrastructure" that supports that work. If you intend to train project managers in a different approach to tracking budget and schedule status, for example, you'll probably need to change some project accounting procedures and perhaps create some new spreadsheets. Make these changes before you do training. There are a number of reasons why this is important. It signifies you're serious about the training resulting in real changes. It further reinforces the content and concepts of the training. It enables the training participants to begin applying the new approaches immediately after training, while they're still fresh in their minds. A few years ago, I led a major initiative to overhaul project delivery processes for a national environmental services firm. We spent over a year preparing for the training--identifying internal and external best practices, determining which new practices we were going to adopt, compiling these in a project managers handbook, creating new tools and resources. The training program, then, specifically addressed the changes we had already decided to make, and participants used the new handbook and associated tools in hands-on exercises during the training. There was no doubt the firm was serious about the training having a lasting impact! Your objectives may be much less ambitious, but there is still wisdom in preparing the way to make the training you're planning be successful. Don't jump into training until you've taken the needed steps in advance to support it. Make sure the training incorporates real-life, hands-on exercises. People learn best by doing, so any good training program should include adequate time for practicing some of the methods being taught. These exercises are still more effective when they involve real-life scenarios. 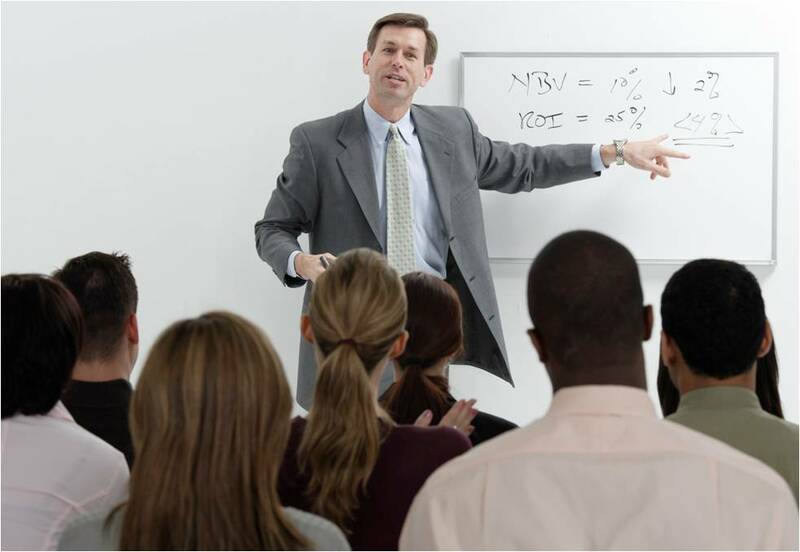 If you're providing sales training, for example, you want participants to have the chance to apply the material to current sales opportunities. This both makes the material more relevant and gives participants a head start in actually using what they've learned. Still better, have participants do some preparation in advance of the training (e.g., pulling sales account information together) so they can get the most out of the exercises. Adopt new terminology from the training program. Many technical professionals fail to appreciate the importance of using new terms to describe new approaches. But the research bears this out. Words have a powerful influence in how we perceive things. Calling new ways by old names only reinforces the natural tendency to revert back to old habits. For this reason, an effective training program should introduce you to some fresh terminology. My advice: Adopt at least some of these new terms as your own. If you prefer your own terms, that's fine as long as it's different from what you've been using. Provide ongoing coaching and encouragement. Changing old work habits is difficult, so don't expect lasting change after training unless you continually reinforce it. Talk about the new approaches and expectations constantly. Get rid of procedures and tools that encourage people to revert back to old ways. And provide ongoing help in applying the new concepts on the job. My favorite approach to training is what I call "real-time coaching." If you wanted training in proposal writing, for example, we would spend a little classroom time covering some fundamental concepts, but spend most of the time actually working together on a real proposal. There's no better way to learn and to help ensure that the training "sticks." But regardless of what approach you use for the training itself, I strongly advocate the use of follow-up coaching. You can learn more about this approach in my previous post on the topic. Reward those who best put the training into practice. The old axiom that "people do what rewards them" is true. If behavior change is the primary objective of training (and it usually is), make sure you acknowledge those who fulfill that objective and reward them for their efforts. Because change is difficult, many people will try hard initially but give up when the effort is not reinforced in some way. Rewarding your top achievers ("changers") also serves to motivate others who may be more reluctant about adopting the new approach. The rewards need not be extravagant or costly. In fact, elaborate tangible rewards tend to displace the more enduring intrinsic rewards of doing things a better way. Focus on the latter, using positive reinforcement to sustain desired behaviors. Time to Rethink Your BD Strategy?